Home + News + Safety Cans for Flammable Liquids: What are the Differences between Type I and Type II? Safety Cans for Flammable Liquids: What are the Differences between Type I and Type II? Safety cans transport, dispense and store flammable liquids. They protect workers by minimizing the risk of accidents and fires when handling hazardous liquids. Justrite® safety cans fall under two major divisions: Type I and Type II. Justrite Type I safety cans feature a single opening for pouring and dispensing. The primary safety features include the spring-loaded cap, the flame arrestor and the handle. Spring loaded caps seal the contents of the safety can, guarding against dangerous spillage and the release of vapors. They also allow the container to automatically vent if the pressure in the can builds, to prevent rupture or explosion in the event of a fire. Flame arresters dissipate heat entering the safety can, preventing any sparks from reaching the vapor space inside the can. Free-swinging rounded handles make the safety can easy to carry and less likely for the contents to put pressure on the inside of the cap. Type I safety cans are designed primarily for pouring into containers with large receiving openings like rinse or cleaning tanks. Some Justrite Type I safety cans are supplied with an attached funnel for filling containers with smaller openings. All Justrite Type I safety cans meet OSHA and NFPA requirements, and are certified by FM, UL/ULC and TUV. Justrite Type II safety cans have two openings. Users fill the safety can through the large opening. A second opening comes fitted with a flexible metal hose for controlled dispensing into smaller openings. Type II safety cans have the same spring-loaded cap and flame arresters as the Type I safety cans. They also offer extra safety features associated with the two openings. Justrite Type II safety cans have an AccuFlow™ manifold with a Safe-Squeeze® trigger handle. This trigger prevents the formation of a vacuum during dispensing, resulting in smooth, glug-free flow of liquid. The user controls the flow rate of discharge by squeezing the trigger harder or softer. A 9-inch (229 mm) flexible metal hose enables users to target small openings for accurate pouring. Hoses are available in 1-inch and 5/8-inch diameters for precision pouring. Type II safety cans feature a fixed handle. This handle acts as a roll bar to protect the cap should the safety can topple over. The larger opening on a Type II safety can acts as a quick fill port. An ergonomic lift lever makes filling the can easy and safe. All Justrite Type II safety cans meet OSHA and NFPA requirements, and are certified by FM, UL/ULC and TUV. 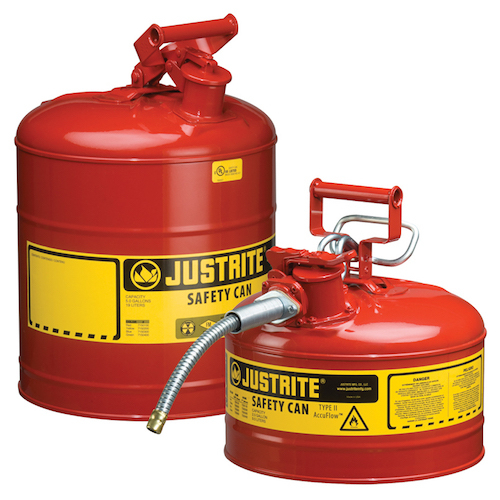 Justrite Type I and Type II safety cans and containers provide safe storage for flammable liquids in the workplace. Safety cans are available in multiple colors to help identify, organize and segregate liquids. Find out more details about our safety cans for flammable liquid storage. Want to learn more about Justrite safety containers? Download this helpful guide detailing differences between Type I and Type II safety cans, as well as important features and benefits.